2nd Edition to the "Long Family Diaries"
So, if you know me... you know cheerleading was my life from about 1993… until, uh, pretty recently. 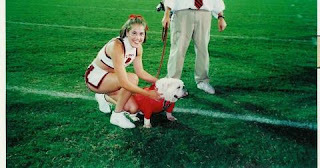 You’d think that would make me the family cheerleader, well… think again! Sally is our ball of energy; a spirit of positive energy and thought. An energizer bunny with contagious optimism. She’s a bright-eyed, smiling, zealous, clapping, wonder woman… always ready to pump-up a room. This is all of course, assuming she’s had ample sleep. Most of you know this Crazy Sally… but, as her daughter, I can tell you that from time to time she does have to decompress and recharge her batteries. Not only is Sally an amazing mother and friend, she is quite the accomplished triathlete! This year at Memphis in May, Sally (age 55) posted a 2:31.26! Her bike split was 1:06.38 (that’s averaging over 22 mph!). In looking over the results… she would have cracked the top ten in the F40-45 age group!!!!! Simply amazing. Anyway, Sally never ceases to astound me. Dedicated to her job at CAT, supportive of her friends & family, and firmly devoted to athletic training… there’s a lot on her plate. With all this going on, her ADHD flairs up from time to time. Don’t worry, Sal, we understand! This causes me recall what I said about Doug. Writing about them almost creates clarity… Maybe Doug & Sally are Yin & Yang. Doug is routine driven, predictable, organized, temperamental, scheduled, firm. On the other hand, Sally is spontaneous, creative, compassionate, easily distracted, lively… He keeps her grounded; honestly I don’t know where she’d be w/out him sometimes. And here’s where I risk angering my dad: I think she provides him with someone to watch over. She needs him, and he likes being needed. Yin & Yang. - Talking her way onto (and flashing her company ID badge… nice, very nice touch) for a ride on the US Military bus: to get from the Memphis airport to a motel in Millington for the MIM triathlon. Of course she made a friend along the way, and the entire group wished her luck in the race! - Running the family van out of gas… I mean, totally out of gas. When the car rolled to a stop along the highway (think nighttime, maybe somewhere in Kentucky) Sally shouts, “Doug, we need gas.” His response, “Well, how about we go to a gas station.” “No,” she said, “I mean, we don’t have any gas.” Leaving Doug to walk along the highway shoulder to the closest exit. -Getting trapped under a cafeteria worker when the woman passed out. Sally was, like normal, helping someone in need. However, she’s probably the smallest employee at the Aurora, IL CAT plant… and when the woman went down, Sally could only yell for HELP, as she was held down by the unconscious person. The list of stories like these could go on. I’m sure more will make it onto my blog soon. Sally, always remember… As crazy as you are sometimes, I wouldn’t change a thing. I love you for who you are, and who you make me want to be. (well, who I want to be… minus a little crazy). Every time I leave my house, it feels like I’m taking an extended trip. Usually, I’m loaded down with a swim bag, duffle of clothes & shoes, hanger (w/ work attire), some food, a purse, odds & ends (sunglasses, water bottle, cell phone)… It’s been like this since high school. Planning ahead, for diverse activities throughout the day, has become a morning ritual. My earliest memories of being a real sherpa were in college… typical college students don’t normally leave an apartment carrying 3 large bags; unless they’re going to a tailgate or party, and the bags are actually coolers full of beer and alcohol. - What do I need to wear for cheer practice (were we in the weight room, working with a tumbling coach, or stunt/dance sessions)? - What should I take to change into for class? - What classes do I have today (What day is it!)? - What books/supplies/papers do I need for those classes? - What garments do I need for my run (what’s the weather going to be like today)? - What am I changing into after the run? - What do I need for OCHS practice (I was the cheerleading coach at the local high school, and we practiced 5-7:30 pm)? …and ALL this needed to be considered each weekday morning. I left the apartment at 6 am in one outfit… and by the time I returned at 8 pm, I’d worn 3 more sets of clothes! Phew, I’m sure I smelled like roses as well. I’m such a nerd, by my sophomore year… I’d color-coded my bags. My cheerleading bag was red and black (actually a nice gift from Nike), my school backpack was black (one of the school colors… also a flattering color for almost any clothing option), and the rest of my clothes were in a royal blue bag (Oconee County HS color, where I coached). Forgetting one of these bags, or any of their assigned contents, would mean having to drive back to my apartment during the day. As this doesn’t seem like a big deal, it could actually throw my day completely off course. I was scheduled down to the hour; there was no room for wasting time in my car. I assumed my bag lady days would end upon college graduation. I would move into a house, come home from work before heading to the gym, eat out more often… HA! I still pack my luggage EVERY morning. Many mornings it begins w/ a trip to the YMCA for a swim, but today is different… I had to pick out an outfit for work (damn office dress code); pack my lunch; figure out what I’ll need for my afternoon workout. Today, I’m going up to N. Carolina straight from work. There, I’ll meet 3 people for an open water swim at Katie’s lake house… fun! So, that means taking a wetsuit and other swim paraphernalia. Maybe we’ll do a short run after we swim? I’m taking running stuff just in case. We’re grilling out after our swim, so I’ll need something to change into (think again if you suggest putting my work clothes back on!). Huh... actually not a bad day. And you know, as well as I do, the preparation needed for a group ride. I suppose this is all part of the deal. When you take up triathlons, plan on BAGS… many, many bags. Tri is 3: as in THREE times the normal amount of CRAP you’ll leave with in the morning. **To those of you with children, I don’t know how you do it! Packing for one person is hard enough. Last Friday, I was like a kid in school… watching the clock, itching to bust out of my office door to enjoy a 3 day weekend! Three whole days of freedom, three mornings to sleep in, three days to unwind… wait, what am I talking about, this is tri-season. Three days to get in long training. During the previous two weekends, I’d done sprint races. Now, with an extended weekend ahead of me… I was looking forward to being outside and getting some miles on my new tires. The forecast called for sunny and upper 80’s / lower 90’s all weekend. Actually, it was so nice on Friday evening; I decided to go for an easy 24 mile ride. My legs felt great, easy pace… I didn’t even notice the hills. At this point, I should have known Saturday would be a different story. For 2 ½ weeks prior to my ride on Saturday, I hadn’t ridden longer than 40 miles in any given workout. Lots of speed work… not so much on the distance side of things. So, sure, bring on 80 miles. It’s a beautiful Saturday morning, what the heck else do I have to do?! Who doesn’t love riding their bike in the Carolina hills, chasing a pro triathlete, for well over 4 hours? After applying what I thought was an ample amount of SPF 40 sun block, filling water bottles, loading up with gels and shot blocks, pumping tires, cleaning sunglasses… Peter and I rode out of his driveway. That’s when I realized my legs had taken a vacation. How did they hear about the Holiday weekend?! Where did they go? There was simply no other explanation… the weather was perfect, no wind, plenty of sleep, hydrated. Mentally, I was ready to go. However, it’s physically challenging to go 80 miles on a bike when your legs feel like they've traveled to the Bahamas to chill on the beach and sip margaritas. I forced myself to keep up with Peter, but even during the warm-up, it was more challenging than usual. Then came the fun part: TT 3 times 9.2 mile loop. Considering my legs were off enjoying a nice buzz… with no intention of returning from vacation, this was not going to be fun. We were time trialing a loop I’ve done many times before. I was going to do the 9.2 mile loop… while Peter used a different road to make his 10 miles. I’m going to omit the gory details about these TT efforts (or the riding in-between, or the bee sting). To be honest, it just plain sucked. I couldn’t muster up any speed, my legs were tired, and when we finished the 3rd TT… we still had 20 miles to ride. Peter, in an attempt to cheer me up, began asking questions about my fatigue. He questioned my fluid consumption, calorie intake, ride the night before… then, he asked if it was too hot for me?! I couldn’t take it anymore… I really just wanted to be done with the ride. That’s when I snapped, yelling about not having ridden enough in the past 3 weeks. It had nothing to do with hydration/food/heat… I just wasn’t ready for a ride like that. We didn’t talk much for the last 15 miles. Usually during warm-up or cool-down, I ride next to Peter… but, not today. Today, I was yards behind… wondering if my legs would bring a nice souvenir upon their return (a pooka shell necklace, perhaps?). But, really I was trying to remind myself that I am NOT a pro, or a guy, or an Ironman for that matter. It’s understandable that I couldn’t keep up with Peter. Before going to bed, I questioned my long run in the morning. Riding a bike while your legs are on vacation is one thing, but running could be an entirely different story. Then, I was too exhausted to think about it anymore. Sleep, must sleep. To get motivated for Sunday’s run, I loaded a few new songs on my ipod (thanks for the Hot Mix part Deux, Ben! It’s awesome!). The weather was fantastic, and I knew I needed to get going to beat the heat. Yeah! They came home; my legs were back… tired from their trip to the Bahamas, but with me nonetheless. After finishing the long run, drinking gallons of water, and showering… all I wanted to do was sit down. Of course, that’s when my friend Kate called. I put on a bikini… that’s right, no speedo for me today! But, when I stood in front of the mirror to apply sunscreen, I saw a tri-geek. Painfully white thighs, sport bra tan line between my shoulder blades, white feet, pale stomach… yuck. Oh well, it was Kate… not Matthew McConaughey. Off to the pool to meet the girls (Noel, my roommate, was going too). We didn’t talk about triathlons, splits, intervals, gear, races, heart rate, or hydration (oh, wait… we did talk about hydration… we wanted to go buy beer, but here in South Carolina… you can’t buy alcohol on Sundays). We talked about guys, upcoming bridal showers and weddings, Sheryl Crow’s new baby, the dude near us with back-hair… which led to a discussion about waxing. Anyway, it was refreshing. We lounged on the pool chairs, harassed 7 year old kids, dove for those weighted sticks, listened to the lifeguard’s Dave Matthews Band mix CD. It made me feel like I was a kid again! The sights, sounds, and smells at a pool in the summer are timeless. (for those of you familiar with Willow Knolls - I'd like to give the WKCC a shout out) Kids running around, parents shouting orders about sunscreen, dads blowing up floats, siblings arguing over towels, getting splashed, adult swims, eating popsicles… it was AWESOME! I can’t blame my legs for taking a leave of absence… chilling out poolside was the perfect way, both mentally and physically, to recover from a hard weekend of training! Kate, thank you for the Sugar Mill Vacation. You have no idea how badly I needed that getaway! 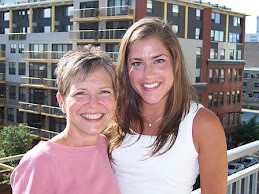 *When I started this blog, I intended to include a short description of my Dad, Mom, and Sister…. However, once I started writing… the words/stories/descriptions started pouring out! Consequently, this will be a 3 part posting. Look for chapters 2 and 3 in the near future. To know and understand me, it helps to know a little about my family members. Although the 4 of us are separated by hundreds of miles… we’re a pretty tight unit. Each person possesses unique talents, personality, and interests. However, there are some major common bonds: attraction to warm weather & the beach, an animated laugh (used frequently when we’re together), and a passion for sports/athletics. and a 1:01.15 – 100 IM! Wowza. He’s also fallen in love with golf. True to typical Doug form, he waited until Sarah and I were off leading our own lives, before taking up this time consuming habit. But, now it seems he just can’t get enough. From what I can gather, it gets him outside (and out of the house), he’s with friends, it’s a challenge, and you can usually follow a round with beer… well, same with a swim workout, come to think of it. Now for the good stuff… he is a routine freak (again, maybe result of the Engineer mindset)! My parent’s house is stocked with boxes upon boxes of shredded wheat and gallons of grapefruit juice. EVERY morning, like clockwork the man eats his breakfast. Not just pour the cereal into a bowl and eat… no, no… he has a mixture! Into a baggie he combines some plain shredded wheat squares with some sugar coated squares. When asked why… he told me, quite simply the plain ones are too bland... but, eating only the sugar squares is too sweet. The morning cereal is a brief example of Doug’s ultra-routine run existence. But, Dad… we love you for it! You are our ROCK. So the lessons began with classroom lectures, frightening videos of “teens gone wild in the driver’s seat,” horrid tales of drunk driving escapades, quizzes on rules of the road… and then we moved into the Simulators, much like an interactive driving videogame... without speed, challenge, or fun. Imagine if you will: a room full of 15 year old high school students… all separated into driving cubbies, buckled up for safety (as if we could actually pose danger to ourselves or something else), hands on wheels, lights off, staring at individual tv monitors, listening for instruction from our teacher (much like the Great Wizard in OZ). Soon we moved onto the suburban roads. I began to find confidence in my driving abilities. That is, until I tried driving MY car. That old VW Scirrocco could have it’s own entry here on my blog. Suffice it to say – it was 16 years old, stick shift, no power steering… and I was scared of it. I was just learning how to use the brake & gas peddle! Now, you’re throwing in another one – called a clutch?! Let’s just not go here… it wasn’t a good time for me personally. I got through it, learned to drive stick, and I have used this skill many times since. Thanks for making me stick with it Mom and Dad! I remember being quite the, uh - teenager, during those one-on-one lessons. *Side note: I am an older sister. (Love ya, Sarah Bear!). Because driving the Scirrocco was such a nightmare for me, you’d better believe I made SURE Sarah experienced the same. Poor girl had to drive that thing too… eventually, I think she killed it. 1. Keen Defensive Driving: I am very aware of where I am on the road, where other cars are, when cars are getting ready to merge. My eyes constantly scan the sidewalk or shoulder… looking for people/objects/cars to get in my way. I watch road surfaces. Quickly swerve to avoid running over impediments. I’m conscious of fellow road warriors… if I’m in the left lane (typically true), and I see a crazy car flying up behind me… I get over! I use turn signals. I don’t cut people off, purposely. I check my mirrors. 2. I like SPEED: Triathletes and cyclists are competitive, by nature. We train for races by swimming, biking, and running… but, give us any challenge, and we’re usually up for aggressive action. By no means am I good at basketball, softball, kickball, tennis, golf, arm wrestling (but, I hear you’ve gone pro… right Jen? ), water polo, bowling, football, dodge ball, kick-the-can, etc… but, I’ll give them all a shot! Anyway, my point is that I like to move fast… in the fast lane. Driving gets my adrenaline pumping. I crave open road, hate traffic, and cuss bad drivers. Sometimes, highway driving can be a fun challenge. You test other people headed in your direction. Passing is fun! Just like in a race… you seek a target moving ahead of you. Soon, you’re up on them. You must decide, if I pass… will I (do I want to) sustain the pace needed to leave them in my dust?! Will they rise to the challenge? Ha ha… not only has triathlon training caused me to enjoy speed on the road, it’s usually the cause for my speeding. In the morning, I’m speeding from the pool, windows open to dry my hair… flying to get to the office on time. Then, again at 5:00… I hit the road, trying to capture the daylight. Get home with enough time to ride… or, in time to meet a work-out group. On the Road of Life… there are passengers, and there are DRIVERS! Fast & Smart Drivers Wanted. Ok, ok... maybe I shouldn't have been quite so boastful about the MANY benefits of life down South! I got carried away talking about the weather, beautiful scenery, mountains, etc… To those of you who were filled with jealousy upon reading my 1st blog entry: release the envy, because a little bird sent a message on your behalf! Anyway, I headed along my usual route. 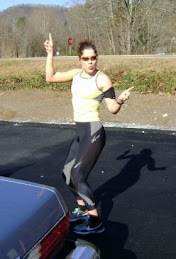 Past Upstate Fitness – quick hello to Kate who was working w/ her personal trainer. Through downtown, falls park, up McDaniel Ave… things were going fine. The songs were rolling along, legs feeling good… and then it hit me. Quite literally on my leg. I saw it coming… falling from the tree. I couldn’t react fast enough. The huge, warm, wet, BIRD DROPPING landed SPLAT on my quad… a spatter of crap quickly mixing with my sweat. Eeewww. I stopped instantly (after 1st hitting stop on my watch ;)… and just looked at it. Since I don’t normally run with a fanny-pack full of baby wipes, I grabbed for the next best thing: leaves. Here I was on McDaniel Ave, smearing bird poo around on my leg…. And just at that moment, who should appear? It was Noel, my roommate, running toward me up the hill. She was already laughing… “what are you doing,” she asked. “The bird got me,” I replied while rubbing my leg with a handful of foliage. All she could do was laugh, then continue her run (she doesn’t run w/ baby wipes either… darn my luck). There is was, a reminder that no place is perfect! Birds poo on you, even here in beautiful South Carolina. Sometimes you get hit with a splatter of crap… but, carry on… keep running. Don’t let it ruin your mood, wipe off with leaves and keep moving my friends. 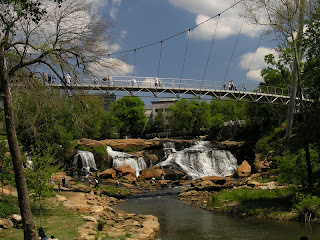 *The pictures above are of "Falls Park" here in Greenville... along my favorite running route, right downtown! The greenspaces are fantastic. I'm back where I belong: The SE region of the US! I love it here... family, the warm weather, sunshine, lack of snow, hills & mountains, beaches, trees, rednecks & confederate flags (ok, I could do w/out a few things). While attending the BEST college EVER -- The Univ. of Georgia, Athens -- I fell in love; In love with this area of the country. After a brief stint back in IL, I've found my way down South once again. This time, for good! 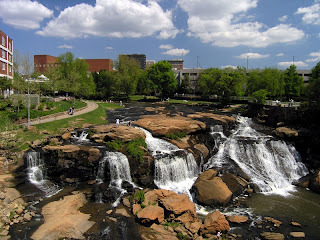 I'm living in Greenville, SC... which is where my mom (Sally - much more on her later, a favorite topic of mine) grew up. I have an Aunt, Uncle, Cousins, and Granny all living within running distance. Perfect for water stops during training ;) Thanks Aunt Libby! I've made some good friends & started a career with the Muscular Dystrophy Association (Program Coordinator). After taking last season off, I'm once again training and racing triathlons. 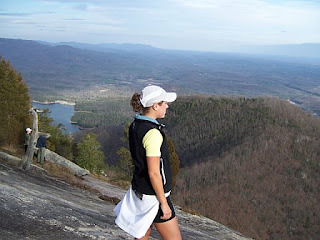 Motivated by fun training partners, gorgeous weather, and ideal terrain... 2007 is off to a great start. I've started this blog for a few reasons... but, primarily because I've been filling up in-boxes across the country! Updates about my house, races, job, etc... Anyway, I'm taking an oath. I solemnly swear to report all future happenings through this blog. When you find yourself saying, "I wonder what Ashley's up to these days." Just check out the blog. To my best friends... I expect this page to be listed under your favorites. Random checks will be done upon my visits! I miss everyone in Illinois, but I love South Carolina! Please plan a trip... you've got a place to stay.